OMG! Shadow and Bone. Have you read it? Of course you have. I mean, how could you not? SO AMAZING! It's hard for me to express my feelings for this book in a coherent manner but I'll go ahead and give it a try anyway. Leigh Bardugo is brilliant. The Russian-inspired world she's created is not only unique, but so authentic and well written. While the mechanics are somewhat daunting at first, I found it easy to acclimate and lose myself in this world. My prior studies in Russian language may or may not have played a hand in this, though. And while the world may have been what drew me in, it was the characters that kept me there. I like Alina. She's a seemingly ordinary girl with hidden, extraordinary powers. And while she may be the most powerful Grisha (behind The Darkling), she's relatable because she's imperfect. Alina is childish, especially when it comes to boys, but given her age, it's to be expected. She has a keen sense of self-depreciating humour and she's got snark, but she's easily jealous and all too often, sells herself short. But these flaws are what make her so memorable, they make her character's arc so much more impactful. Another thing that really makes Alina stand out is her crush on childhood BFF, Mal. Like many of us IRL, Alina pushes her feelings aside because of the dread. She dreads losing her best friend and fears rejection. It's easy to see why she's so drawn to Mal. He's cocky, headstrong and the hunkiest tracker about town. I completely loved the ease of their friendship and their playful banter, especially towards the latter half of the book. Mal, too, is a flawed character and he often takes Alina for granted. It even gets a little frustrating because he's kind of a jackass and she's so hopelessly enamoured with him. Mal's got flaws but those imperfections are what make him stand out in a sea of the other "too perfect" YA male leads. The problem with Alina being rejected so much by Mal is that it makes her easily wooed by someone else, namely, The Darkling. Ah, where do I even start? He's a mystery, an enigma. Some say the villain, I say, antagonist. Either way, being bad never looked so good! He's unreadable, dark, mysterious but seemingly has good intentions despite his tough and calculating exterior. Even when Alina finds out how ruthless and dangerous The Darkling is, a part of her still wants him. Though we learn that most things about him are merely a façade, I think he genuinely does have some real emotion for Alina. In Shadow and Bone, Bardugo has crafted some seriously amazing secondary characters. They don't take a back seat to anybody! Like Genya, for example. Please tell me I'm not the only one rooting for a GENLING coupling. I mean, think about it. Such a power couple! And The Apparat, even in book #2, I still can't figure him out. Then there's Baghra. Baghra drops a bombshell on Alina (and us) with The Fold's real purpose and The Darkling's real agenda. Though her purpose may be to provide momentum to move the storyline forward, she still draws you in and makes you want to know more of her secrets and hidden mysteries. The age of Grisha power is coming to an end. Because of this, they rely less on magic and more on man-made tools of war. I liked the blend of fantastical and more real-world elements. It was totally believable and gave the book a very historical feel. In addition, everyone seems to be playing a game of deception and I loved the challenge of trying to figure out who was the real deal and who was not. Let me just tell you---on more than one occasion, I was left reeling. THIS is the wow factor I've been craving for quite some time. I haven't fallen this hard for a series since I read Veronica Rossi's Under The Never Sky books and it was long overdue. I'm happily devouring the sequel now and the release of Ruin and Rising couldn't come soon enough! Shadow and Bone is definitely in the running to be one of my favourite reads of the year. Leigh Bardugo's unique, Russian-based fantasy is alluring and engaging and wholly satisfying. Her characters are wonderfully flawed and snarky and dangerously captivating. This book will enrapture you with its seriously addictive story and entwine you in it's magically dangerous snare. And promise you, it won't hurt one bit! I better get my stuff together and read this! Great review! I really do think you'll enjoy this one! 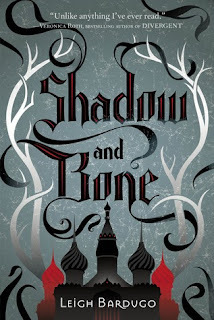 Wow, Shadow and Bone sounds fantastic. I love a baddie that can make me swoon. I'll have to add this to the ol' wish list. Oh man, The Darkling! I just can't get enough! And the series gets better and better.